Sukumar’s super hit film Arya is considered a special film in the career of Allu Arjun. This film instantly catapulted him to the big league. He has revealed several times that this film is close to his heart. Arya released on May 7th exactly 10 years back, and Arjun expressed his happiness on face book sharing some light moments with his fans. 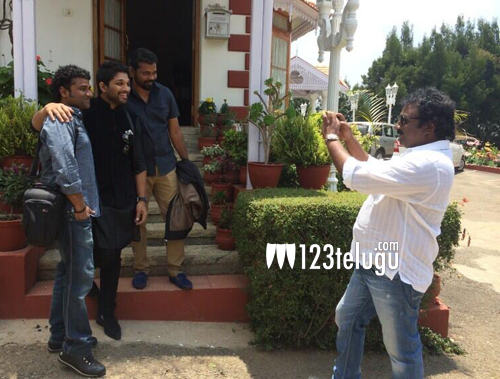 Bunny was celebrating Arya’s 10 years with Sukumar and Devi Sri Prasad in Ooty while VV Vinayak joined in. Devi Sri Prasad said, “n OOTY we realized that AARYA completed 10 years..So V.V.Vinayak garu clicked a pic of Suku,Bunny n Me as a memory:))”. Allu Arjun is currently basking in the success of Race Gurram. He will be doing a film with Trivikram soon.